The king purUrava spent time with this celestial maid Urvashi like this:  in the beautiful chaitra-ratha gardens of kubera - 10 yrs;  on the banks of River mandAkini – 5 yrs;  in alakapuri, the city of kubera – 5 yrs;  in the city of vishAla [or, badari] – 6 yrs;  in the foremost nandana gardens – 7 yrs;  in northern-kuru province that is replete with trees yielding whatever fruit desired – 8 yrs;  at the foot of Mt. gandhamAdana – 10 yrs;  and later on Mt. meru – 8 yrs. “Oh, king, you should not show himself to me in nakedness; you should copulate only when I am of a mind; two goats are always to be stationed in the vicinity of my bed; and I just take a lick of ghee, clarified butter, as my single-time food per day... and oh, king, my stay with you will come true, so long as these conditions are met with... these are my terms...” Urvashi said so to purUrava. haimavatyAM= haimAni, sauvarNAni padmAdInAm... dhArayati - puShkaraNi. ...So that we can continue our relations in heaven also...” samata = sAlokyam, sArUpyam= coequality. 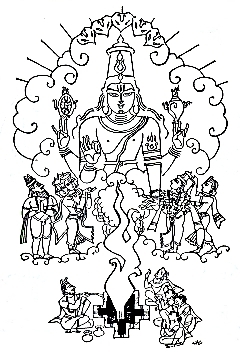 Thus, this is the twenty-sixth chapter of first canto called harivamsha-parva, in harivamsha-purANa, the sequel of mahAbhArata, narrating the legend of Urvashi and purUrava.